In planning my trip to Chicago, I had allowed time to spend a couple of hours of quality time knitting at Loopy Yarns, one of my favorite Chicago Yarns stores, after I finished my presentation. If I lived in Chicago, it might be a favorite LYS. Unfortunately, while I was making coffee, I got a text message from American Airlines that my 7:25 pm flight to Newark was cancelled due to weather. After talking with a a helpful reservations person, I was rebooked on a 2:55pm flight which translated to no afternoon to play in Chicago! That said, when I finished my morning panel, I had about 20 minutes to get from the Chicago Hilton to the blue line to make my flight. Since the Hilton is an under 5 minute walk from Loopy Yarns even in the lightly snow covered sidewalks, I decided to make a quick yarn pitstop. It was my first visit to their current location at 47 Polk Street. I parked my bags by the register and took a quick survey of the store. There’s an inviting room filled with books where one can knit (oh, if my flight hadn’t been cancelled.) There was a wonderful hank of a bulky yarn in purples and reds that caught my eye when one of the salemswomen informed me that there were sales yarns downstairs. A small twisty stairway like they have in many NYC duplex apartments leads to a lower level which has separate rooms for different classes. Wrapped around one of the tables were different sales yarns at discounts of up to 50%. In the 25% off section, I found my favorite type of yarn–blue face leichester. There were skeins of Fleece Artist’s hand dyed blue face leicesterl aran. With no time to spare, I quickly eliminated colorways that I didn’t like or want. 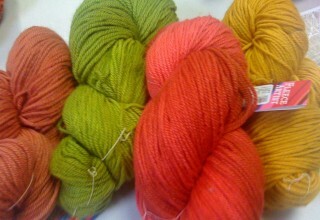 I took three skeins, one of moss green, one of mustard gold, and one of a dusty rose to the cash register to decide. A friendly woman who was making a blanket let me go to the head of the checkkout line to buy my single skein of moss green aran yarn. I asked for directions to the blue line CTA and grabbed my bags. I think that the shopkeeper was still shaking her head as I wheeled away from the store at a rapid New York pace. As I sat on the blue line headed out to O’Hare, I wished that I had had more time to linger over the colorful hanks but I had a plane to catch. I smiled to myself happy that I had given myself the small peek at Loopy Yarns. 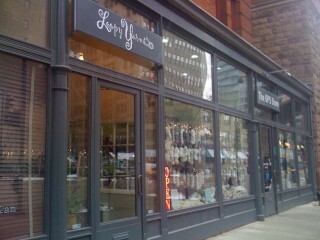 If you’re in Chicago, I strongly recommend a visti to Loopy Yarns. It’s a friendly place which is conveniently located to several CTA lines.